The Commercial Vehicle Enforcement Division (CVED) is responsible for the annual inspection of every black and yellow school bus and pupil transportation vehicle operated in the state. Michigan has approximately 17,000 vehicles that transport in excess of 800,000 children over 10 million miles annually. All public, private, denominational, parochial, charter school and public school academy vehicles transporting pupils to or from school, or school-related events, must be inspected. This includes every vehicle under contract or agreement. 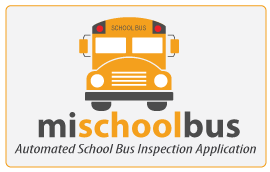 Effective September 1, 2014 the Automated School Bus Inspection (ASBI) application is now capturing all school bus inspection data. Each pupil transportation vehicle is assigned a bar code that inspectors will use to pre-load school bus identifying information into the database to begin inspection. In addition, a corresponding QR code sticker will be displayed on the service door of each school bus. Using a smart phone with QR Reader app, scanning the QR code will allow public access to individual school bus inspection information. The ASBI will help identify violation trends that can be relayed to school districts and contractors. Access to this information, combined with appropriate response by the transportation industry, will help ensure that school buses in Michigan continue to be the safest vehicle for transporting children to and from school.